The overdrive pedal is one of the most timeless and classic effects for electric guitar, and finding the overdrive of your dreams can be a lifelong endeavor. They have become a true cult object and manufacturers have seized the opportunity to expand the offering exponentially throughout the years. Given the saturation of the market, it's not easy to make your way through the jungle of products available. To make you life easier, we decided to poll the members of the French version of Audiofanzine to have them choose their favorite overdrive pedals from a list of the most indispensable models. It's not surprising that our readers have consecrated the most classic overdrive pedals of all time. Three of them clearly stand out from the rest, with the Ibanez TS808 at the top. Next up are five of Boss's flagship pedals and the Maxon version of the Tube Screamer. Fortunately, some troublemakers have managed to make their way among the big shots, like Xotic with their BB Preamp! 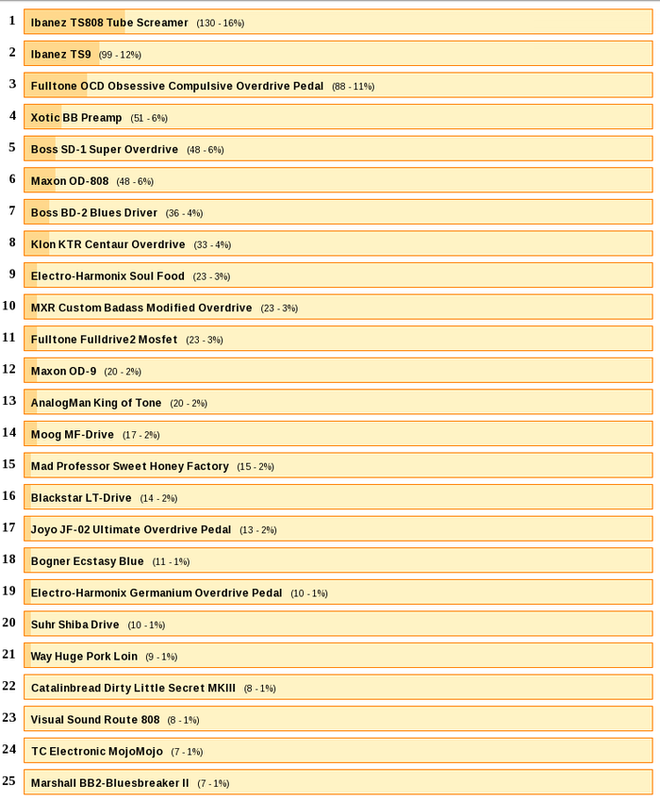 Here's a brief review of the eight highest ranked pedals in the poll, in which 807 AF members took part. Do we really need to introduce the most legendary overdrive pedal ever? 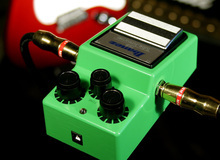 Its green case has made more than one guitar player fantasize about it ever since it came out in the '70s. Some of the finest hands (and feet) in the guitar world have made use of the TS808 and it has helped define the sound of an entire breed of blues rock. Highly appreciated for its ability to make an instrument cut through the mix, the TS808 can still be found in the Ibanez catalog today. The model sold by the brand nowadays features the original Japanese JRC-4558 chip (they are not vintage chips), but that hasn't always been the case. Ibanez has also marketed different versions, some of them featuring the Texas Instruments RC4558P chip. And there are always Reissue and Anniversary models popping up to pay homage to older iterations of the TS808. Launched in the early 1980s this pedal shares the same circuit as its older sibling, the TS808, but with a modified output section. It sounds very similar to the original Tube Screamer, although it has a reputation for being softer and less brilliant. Some models feature a JRC-4558D chip, but some other versions have been marketed with the JRC-2043DD or TA75558 chips. The Reissue currently sold by Ibanez features the latter, while Maxon uses a JRC-4558D (called NJM today) for the OD-9 (number 10 in the list). Even though it's less renowned than the Ibanez models above, the OCD has also garnered an excellent reputation and is one of the best-sellers in Fulltone's catalog. It probably owes that reputation to Michael Fuller's will to offer an overdrive pedal that doesn't compromise dynamics despite the clipping diode. The op-amp features a JFET transistor and a pair of MOSFET transistors further down the chain. Its design provides it a lot of versatility and a huge gain reserve. When Japanese company Ibanez started marketing pedals in the early '70s, founder Hoshino Gakki entered a license agreement with OEM pedal specialists Nisshin Onpa to have them manufacture all Ibanez pedals. So, from 1974 onwards it was in fact Nisshin Onpa who conceived and manufactured the pedals that sported the Ibanez brand. Until 2002, when their collaboration came to an end. Ever since, Nisshin Onpa has kept on manufacturing its version of the Tube Screamer under the brand Maxon. The OD808 uses the classic JRC4558 chip of the TS808, but they changed some resistances to get less untimely noises. This version is a bit smaller and less expensive than its direct competitor. Xotic is a sort of Tom Thumb among the big names in the list. However, the company hailing from California has little by little established itself in the guitar pedal market ever since it opened its doors back in 1998. The BB Preamp can work as a clean boost (30dB+), but also features a preamp stage to get a softer and more compressed sound. Add to that a 2-band EQ instead of the traditional tone knob and it's easy to understand why it got so many votes among our readers. Guitar players have a love/hate relationship with Boss. Often criticized, the pedals of the Japanese brand offer a great value for money and, hence, can be found on many pedalboards all over the world. The SD-1 was introduced at the dawn of the '80s. It is very similar to the TS808, but with an asymmetrical clipping, which makes it a bit louder and with more harmonics. Up until the '90s, the SD-1 was made in Japan, before manufacturing moved to Taiwan. While both Japanese and Taiwanese models feature the same JRC4558DD chip, they are different in quite a few respects. Not many components are the same and the pedals made in Taiwan are often criticized due to their unreliable quality. Beware: legendary pedal ahead! The KTR is a replica of the Klon Centaur. The original model was introduced in 1994 and became an instant success with the great Jeff Beck as its main ambassador. Bill Finnegan, the mastermind behind it, was trying to reproduce the sound of the Fender Twin Reverb pushed to the limits, but at a lower volume. Disappointed by the TS808 and TS9 (really?? ), he wanted to create an overdrive that was less compressed and more generous with low frequencies. With the help of two MIT engineers, he worked relentlessly (almost 60 hours per week according to him) to conceive a high-end pedal whose tiniest component was custom-made. That's how the Klon Centaur came to be. 15 years and 8,000 pedals later, Finnegan stopped production unexpectedly, exhausted by the work burden. In 2008 he began thinking of a successor to the Centaur, but whose design allowed a more comfortable and larger production. Enter the KTR. Smaller than it predecessor, it features the same circuits and operation, including its unique clipping diode system with germanium semi-conductor. However, unlike on the Centaur, the components of the KTR are surface mounted. Finnegan also added a switch to choose between the original mode with buffer and a new True Bypass mode. Initially aimed at blues players, the BD-2 is a household name in the overdrive pedal world. It is often considered more transparent than the TS808 and less concentrated on the mid frequencies. This means that the highs and lows are played up. Some people find it a bit too shrill with a clean Fender-type amp. But, as usual with not too expensive gear, it can be customized in lots of ways by the skillful hands of modders such as Keeley and AnalogMan.